The tradition of the killer car movie encompasses such diverse efforts as Christine, Duel, Death Car on the Freeway, and, if one expands one’s definition, Killdozer (featuring a killer bulldozer). 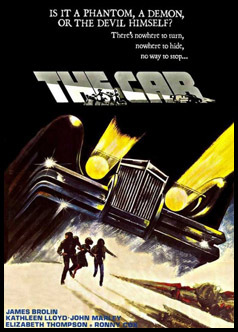 The trend was never as firmly established as, say, the slasher film, but one would nevertheless be hard pressed to find a purer example than Elliot Silverstein’s The Car. The movie opens with a shot of a vast stretch of desert. Suddenly the sunlight reflects off something in the distance, followed by a trail of dust being whirled into the air. A low roar is heard, rising in volume until it becomes recognizable as the sound of a car engine. Then, a horn blares. Two young backpackers, Peter (Bob Woodlock) and Suzie (Melody Thomas Scott), are riding their bikes on a desert road when a big, black, oddly designed car rolls up behind them, blaring its horn. It pulls up alongside the girl, but instead of passing her, it presses her against a stone wall, knocking her off the road. Peter tries to outrun the car, but when he reaches a bridge spanning a deep canyon, it rams against him, and he falls to his death. Later, the same vehicle runs down a horn-playing hitchhiker outside the home of Amos Clements (R.G. Armstrong), a blasting contractor. Wade Parents (James Brolin), a local police captain and father of two, is called to the scene. Amos witnessed the incident but has trouble describing the vehicle, stating that it looked both foreign and domestic, had a squeezed down top, but no license plate. The same day, Suzie’s body is discovered. Wade and Sheriff Everett (John Marley) discuss whether the car that ran down the hitchhiker could be involved, and Everett orders roadblocks, sealing off the entire town and its surrounding area. Amos’ wife, Bertha (Doris Dowling), shows up at the police station with bruises on her face. Everett wants her to press charges against her husband, but she leaves in tears. Everett seems disheartened by this and goes to the club for a drink. While crossing the street, he witnesses an argument between Amos and Bertha. Then he notices a black car parked by the pavement. The car suddenly accelerates towards Amos but swerves, running down Everett instead. At the station witnesses to the incident are interviewed. Among them is an old Indian woman, whose statement is translated by Chas (Henry O’Brien), a native speaker. To Wade’s frustration, he dismisses part of her statement and fails to translate it. 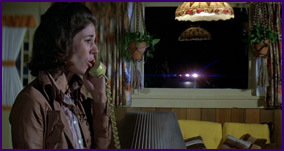 The next morning, Donna (Geraldine Keams), another native speaker at the station, tells Wade what Chas left out: There was no driver in the car. Wade asks Luke (Ronny Cox), an officer, to call the school principal and cancel their upcoming parade rehearsal. Luke fails to contact the school, and later the same day, the parade rehearsal is in full swing, horses, marching band, and all. However, chaos breaks out when the horses suddenly become spooked and powerful gusts of wind whirl clouds of dust into the air. The car makes its entrance, blaring its horn, and Wade’s girlfriend Lauren (Kathleen Lloyd) directs the students to the cliffs while men on horseback try to distract the murderous vehicle. The riders buy Lauren enough time to lead the children to an old cemetery, but the car is in unrelenting pursuit. The car stops at the cemetery gates, seemingly unable to enter. Lauren gathers enough courage to hurl insults at the car, challenging the driver to get out. Luke’s girlfriend, Margie (Elizabeth Thompson), makes a narrow escape and calls for help on a police cruiser radio. Wade answers and summons the entire police force to the cemetery. An officer maintaining a road block sees the car and pursues it. Wade dispatches two more police cruisers to intercept it and gets on his motorcycle to join the chase. The result is disastrous. The car manages to ambush its first pursuer, pushing him off a cliff. The two remaining cruisers find the car coming at them at high speed. They try to force it of the road, but at the last moment, it flips over, crushing both cruisers, and escapes undamaged. Wade arrives at the scene, and the car stops a few yards from him. He fires at it, but does no damage. He then walks up to the car to peer inside, but the right side door swings open and knocks him down, upon which the car simply drives away. After visiting Wade in the hospital, Lauren gets a ride home with Chas. When he drops her off at her house, the wind picks up, and she runs inside. Frightened, she phones Wade, telling him that she thinks she can hear the engine of the car. Just then, the car crashes through her window, crushing her in her own living room. Wade is devastated and gathers what is left of the police force in a last ditch attempt to stop the car. He also secures the help of Amos, the blasting contractor. Amos and the police officers load explosives onto their trucks to set a trap for the car while Wade drives home to check on his daughters. To his horror, he finds the car waiting silently for him in his garage. He barely escapes on his motorcycle, with the car hot on his tail. He races toward the canyon, where Amos and the remaining policemen are preparing a trap. Wade tries to buy his companions some time by distracting the car, but he loses his motorcycle trying to run over a steep slope and must scale a vertical side of cliffs to escape. The car turns back to find another way to the top of the canyon. Here, it traps Wade and Luke between itself and the edge of the cliff. It tries to run them down, but they dive just in time, and the car sails off the cliff into the canyon. The men hit the detonator, and a mighty explosion erupts from the canyon, followed by an inhuman scream. An enormous figure with claws and fangs is briefly seen in the flames, but Wade refuses to talk about it. Released in the theatres the same year as Smokey and the Bandit, The Car has often been called “Jaws on wheels”. The similarities to Jaws are obvious: A man of the law must defend his isolated community from a monstrous killer. Similarities have even been pointed out regarding the use of subjective camera for the first kill. Much like Jaws, The Car also takes time to weave the personal storylines of its characters into the overall plot structure. Themes such as domestic violence and alcoholism are introduced, giving the characters perhaps more depth than one would think was required for a story about a killer car. That said, these elements do not slow down what is essentially a fun, suspenseful movie. As one might expect from a killer car movie, there are plenty of exciting stunts. That said, The Car also boasts a few shots which are downright elegant, with the best perhaps being Lauren’s final moments. The terrified woman is sitting by the window, convinced that she can hear the engine of the car – and outside, two small lights grow larger and larger until the car crashes through the window. Whenever the cinematographer can have the killer and the victim occupy the same frame and have one be unaware of the other, there is tension, and that is exactly what happens here. The car itself is a suitably menacing creation. A modified Lincoln Continental Mark III, it looks like a giant, black coffin on wheels. Driverless and unable to enter hallowed ground (but otherwise unstoppable), it is plainly demonic. It spares the life of Amos, a racist who habitually beats his wife, killing the kindly sheriff instead. Perhaps it felt that a man like Amos furthered its goals on Earth? It even comes with an introduction by Anton LaVey, High Priest of the Church of Satan: “Oh great brothers of the night who rideth upon the hot winds of hell, who dwelleth in the Devil's lair; move and appear!” As such, the car itself feels less like a comment on how a car can be a deadly weapon in the wrong hands, and more like a convenient, if unconventional, monster choice. And what exactly is the car’s relationship with Wade? Not only does it fail to kill him on several occasions, even when it could have done so easily, it also kills his superior, promoting Wade’s authority at the station, as well as his girlfriend, leaving him single and available. And it follows him home. What’s up with that? Is the car stalking Wade? Is it in love with him? Nah! But it is an amusing thought. So, “Jaws on wheels”? Perhaps, but for all the similarities, the tone is different. Compared to Spielberg’s classic, The Car is definitely lighter. It’s a heady, fast-paced horror movie with just a little bit of heart. It’s even a little spooky – you’ll no doubt be humming Leonard Rosenman’s ominous reworking of Dies Irae when the credits roll. Contributing writer Kim Bruun Dreyer is a native of Denmark who has gobbled up horror pictures from an early age. He concluded his university education with a thesis on textual references and the role of the subjective camera in slasher films, and has contributed to the Danish genre webzine UNCUT.DK. He enjoys listening to opera, performing in amateur Shakespeare productions, and curling up on the couch with a scary movie.